Bentonite is very common drilling fluid used in bored pile construction. The pre-requirements of applying bentonite is to submit all properties, relevant in this regard, of bentonite before commencing boring operation to authority. The traditional requirement for shear strength of slurry is not important here, which is more relevant to oil drilling projects. In simple word, for usual pilling work viscosity, density and fluid loss are the controlling parameter. PH Of slurry indicates degree of contamination but where filter cake thickness or sand content is found excessive, poor piling performance is reported. It is suggest to take a flexible approach to determine extent and range of compliance of test results for individual site and reviewed time to time for evaluating piling performance. This compliance is important to meet requirements of specification to ensure the integrity or resistance of pile or may be both. As drilling progress, bentonite slurry will be contaminated by soil sediments. Thus we should stipulate requirement of slurry at specific stage of drilling or subsequent concerting. Requirements for slurry are usually stipulated when supplied to pile but requirements for bentonite are for before placing of concrete. Density/unit weight of drilling slurry is the solid content remains in suspension. In case of mineral slurries, we expect them to hold solids for long periods in suspension, which seek mineral slurries to have higher allowable density than that expected in case of synthetic slurries or water (it doesn’t contain solid as well in suspension). The viscosity of such slurries may influence their density as more viscosity of fluid means it suspend more amount of solids. An upper limit of density is provided in suspension of drilling slurries as described below; the upper limit is essential due to instability of slurry at higher density in respect of their capability to keep solid in suspension. These solids may come out of suspension resulting settled solid during placement of concrete and may result defects in pile. Density should be ≤ 1.10 g/ml in fresh bentonite or recycled condition, the before concreting value should be ≤ 1.15 g/ml. Local contractors usually supply ≤ 1.o15 g/ml ~≤ 1.03 g/ml for fresh state and ≤ 1.15 g/ml ~≤ 1.2 g/ml for bentonite before concreting. Sand is that particles retained on No. 200 sieve; sand content in drilling slurry is a controlling parameter for good drilling operation especially just before placement of concrete. As mineral slurries usually hold sand particles with other solids in their suspension; allowable value of sand content is more than that allowed in synthetic slurries or water. Water is included in discussion repeatedly as it is considered as drilling fluid for right condition which doesn’t carry sand in suspension. Upper limit of sand content is set to prevent falling out of significant amount of sand from suspension during placement of concrete. Another reason for kept value of sand content limited is higher value can enhance the formation of filter cakes around the walls of drilled hole with mineral slurries. This filter cakes, if allowed in drilled hole, it would reduce skin friction of pile, thus pile capacity will be reduced. Thus excess filter cake may need to be removed physically before placement of concrete in drilled hole. Viscosity means thickness of drilling slurry; the property is required to determine whether it is too thick to allow more solid in suspension than permitted. They have negative influence on sand content and density of drilling slurry. On the other hand, higher viscosity of drilling slurry is required for some soils to permit formation of filter cakes during drilling or to stabilize the walls of drilled hole. This is required in case of loose formation within the ground like gravel. When a drilling slurry thinner than allowable value, it has tendency to penetrate through loose ground formations not forming filter cake or establishing stability.After completion of drilling a hole i.e. sufficient filter cake has been developed or side of drilled hole have been stabilized, a thinner drilling slurry may be supplied as required before placement concrete. Viscosity of bentonite must lie between (29-50) sec. This value of drilling is indicative to proper function of it. It actually indicates whether drilling slurry is in fully hydrated condition or not. Thus PH value of it is important to confirm complete hydration of clay mineral or having expected viscosity. The allowable range to ensure expected property of drilling slurry will be stated below. 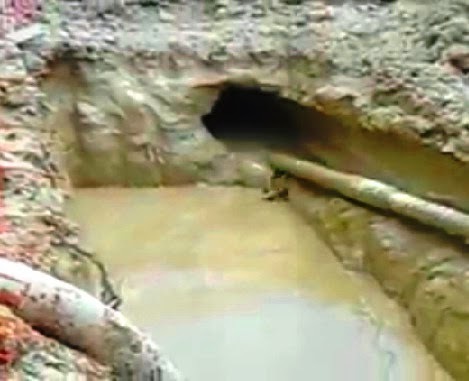 Drilling slurries are mixed in controlled environment (like in mixing tank) and before supplying to drilling operation the PH value is maintained to have expected range; but when they come in contact with organic matter or acids from ground water or soil, they may be affected and these value should be checked time to time. Mineral slurries like bentonite may get flocculated and soft, thick filter cake may form when the slurry becomes too alkaline or too acidic. PH should be greater or equal to 9.5. These requirements can be altered when design engineer considered them okay. In case of PH less than 9.5, in no circumstances bentonite slurry can be used. When PH of bentonite slurry is greater than 9.5, it looks dirty, QC engineer have authority to reject slurry to be used further. The level of bentonite slurry should be kept at least 2 m above water table and this level are always maintained not less than 2m form top of steel casing. Foundation piling is done depending upon structural requirements, ground conditions and project budget. Piles foundation is required for their development whether temporary to provide a safe system of work or permanent as part of the most economic solution.